Terry Collins said there was no question in his mind: Jon Niese may have been only at 60 pitches after three innings. But with the Mets already having trimmed a five-run deficit to three runs, and with two Mets on base in the top of the fourth, Collins decided to lift Niese for pinch hitter Lucas Duda. Duda struck out against J.A. Happ and the Mets ultimately lost, 6-3, Tuesday night. But Collins was confident afterward in the appropriateness of his decision. Jon Niese was pulled after three innings, having allowed a pair of homers and five runs. 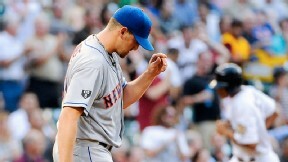 It ended up being Niese's shortest start since going only 2 2/3 innings against the Milwaukee Brewers on Sept 29, 2010. Asked if it was particularly tough to lift Niese after three innings knowing unproven rookie Chris Schwinden goes Wednesday afternoon, Collins replied: "Chris has only gone one time, so it's tough to judge how far he's going to go. But when you're in a game where you're down five and you have a chance to tie it, I think you've got to take the opportunity. "As you saw, we didn't have another chance the rest of the game to tie the game. So I took my chance then." Asked if he was shocked by the decision, Niese said: "Yeah, kinda. Obviously the competitiveness in me, I wanted to stay in the game there. I put up a zero and I felt my stuff was good enough to keep the team in the game. But it's not the way it worked out. It's over now, and I've just got to move on." All the damage against Niese came on homers -- a two-run shot in the first inning by Jed Lowrie, then a three-run shot an inning later by Chris Snyder. "That Lowrie pitch, looking back I kind of regret throwing him a fastball there," Niese siad. "I wanted to throw him a curveball. I threw one up and in on him and he got it. And then the Snyder one, he just ambushed me first pitch. He got that one too. Other than that, I felt great. It's just one of those games where it gets away from you early." Said catcher Josh Thole: "Snyder was just a sinker that just stayed up. I think sometimes when that happens it just takes the wind out of you a little." The Mets walked eight batters as a staff, with the final run coming when Ramon Ramirez walked in a run that was charged to Miguel Batista. Batista walked four in 2 2/3 innings. Three of the outs he recorded came on a sacrifice bunt and two caught stealings. "You just can't put people on and expect to win Major League Baseball games -- especially walking in runs," Collins said. "I mean, it's going to come back to burn you."